What Is Aspartame & MSG Made Of? Dr. Russell L. Blaylock, a professor of neurosurgery at the Medical University of Mississippi, recently published a book thoroughly detailing the damage that is caused by the ingestion of excessive aspartic acid from aspartame. Blaylock makes use of almost 500 scientific references to show how excess free excitatory amino acids such as aspartic acid and glutamic acid (about 99 percent of monosodium glutamate (MSG) is glutamic acid) in our food supply are causing serious chronic neurological disorders and a myriad of other acute symptoms. Aspartate and glutamate act as neurotransmitters in the brain by facilitating the transmission of information from neuron to neuron. Too much aspartate or glutamate in the brain kills certain neurons by allowing the influx of too much calcium into the cells. This influx triggers excessive amounts of free radicals, which kill the cells. The neural cell damage that can be caused by excessive aspartate and glutamate is why they are referred to as "excitotoxins." They "excite" or stimulate the neural cells to death. Aspartic acid is an amino acid. Taken in its free form (unbound to proteins) it significantly raises the blood plasma level of aspartate and glutamate. The excess aspartate and glutamate in the blood plasma shortly after ingesting aspartame or products with free glutamic acid (glutamate precursor) leads to a high level of those neurotransmitters in certain areas of the brain. Sun Chips, Cheetos and Doritos are especially bad. Both Cheetos and Doritos list MSG as an ingredient. As a private citizen, I performed a 2-1/2 year study, putting aspartame in the form of packets of NutraSweet in the drinking water of 60 rats and keeping 48 rats as controls. My female rats received about 45 mg/kg of aspartame per body weight per day. My males received about 34 mg/kg/day. 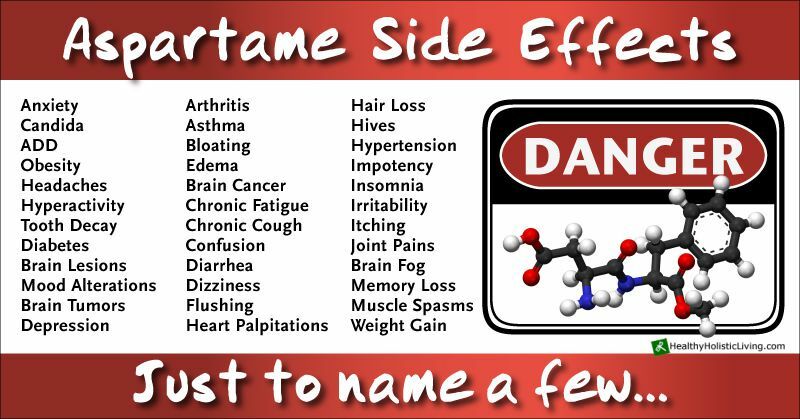 Of the 30 females in the aspartame group, 20 or 67% developed tumors the size of golf balls or greater. Seven males from the aspartame group developed visible tumors -- 23% of all males on aspartame. The total number of rats with tumors in the aspartame group was 27 – 20 females and 7 males. The percentage of females-to-males was therefore 20/7 or 286%, which coincides with the observation of H.J. Roberts, M.D, author of Aspartame Disease: An Ignored Epidemic, that females are more affected by aspartame than males by a 3:1 ratio. The rats on aspartame also developed miscellaneous health issues, such as paralysis and other apparent neurological problems, eye problems and skin disorders, thinning and yellowing fur, and obesity, which is sad, because many people use aspartame to lose or maintain their weight. Female rats with tumors video. H. J. Roberts, M.D., Aspartame (NutraSweet): Is It Safe? A Concerned Doctor’s Views (Philadelphia, PA: The Charles Press, 1990). This is a book on the severe reactions to products containing aspartame. The artificial sweetner Aspartame, marketed under the name NutraSweet, is being consumed by nearly 100 million people in the US alone. The author is a specialist in internal medicine who has been responsible for major research studies in the fields of diabetes and hyperglycaemia. He became suspicious of Aspartame when he encountered an increasing number of patients with diverse symptoms which could not be attributable to specific medical problems. This book presents his findings which were arrived at through personal clinical encounters as a practising physician and through an extensive study of people with adverse reactions to Aspartame. It includes clear descriptions of the numerous reactions which patients and others have suffered. Dr. Miladie L. Dillard, Food Sweeteners: Aspartame and Its Adverse Reactions, Strange Symptoms, Illness Behavior and Controversy: Index of New Information with Authors and Subjects (1997). George Andrews, Ph.D., The Aspartame Documents: What Industry and the FDA Don’t Want You to Know, (Healthnet Press, 2002). James Balch and Mark Stengler, Prescription for Natural Cures: A Self-Care Guide for Treating Health Problems with Natural Remedies Including Diet and Nutrition, Nutritional Supplements, Bodywork, and More, (John Wiley & Sons, 2004). Michael Barbee, C.D.C., Politically-Incorrect Nutrition: Finding Reality in the Mire of Food Industry Propaganda (Ridgefield, CT: Vital Health Publishing, 2004). Russell Blaylock, M.D., Excitotoxins: The Taste That Kills (Albuquerque, NM: Health Press, 1996). Russell Blaylock, M.D., Health and Nutrition Secrets That Can Save Your Life (Albuquerque, NM: Health Press, 2002). Russell Blaylock, M.D., Natural Strategies for Cancer Patients (New York, NY: Twin Streams Kensington Publishing Corp., 2003). Dr. Janet Starr Hull, Sweet Poison: How the World’s Most Popular Artificial Sweetener Is Killing Us--My Story (Far Hills, NJ: New Horizon Press, 1999). Beatrice Trum Hunter, Consumer Beware! Your Food and What’s Been Done to it (New York, NY: Bantam Books, 1972),. Barbara A. Mullarkey, Bittersweet Aspartame: A Diet Delusion (Health Watch Book, 1992). Dr. Joseph Mercola, Sweet Deception: Why Splenda, NutraSweet and the FDA May Be Hazardous to Your Health, (Nashville, TN: Nelson Books, 2006). Dennis W. Remington, M.D. and Barbara W. Higa, R.D., The Bitter Truth About Artificial Sweeteners (Vitality House International, Inc., 1987). Byron J. Richards (Board Certified Clinical Nutritionist), Fight for Your Health: Exposing the FDA’s Betrayal of America (Tucson, AZ: Truth in Wellness, LLC., 2006). H. J. Roberts, M.D., Aspartame Disease: An Ignored Epidemic (West Palm Beach, FL: Sunshine Sentinel Press, Inc., 2001). H.J. Roberts, M.D., Breast Implants or Aspartame (NutraSweet) Disease? : The Suppressed Opinion About Perceived Medicolegal Travesty, booklet edition (West Palm Beach, FL: Sunshine Sentinel Press, Inc., 1999). H. J. Roberts, M.D., Sweet 'ner Dearest: Bittersweet Vignettes About Aspartame (NutraSweet) (West Palm Beach, FL: Sunshine Sentinel Press, Inc., 1992). Carol Simontacchi, The Crazy Makers: How the Food Industry is Destroying Our Brains and Harming Our Children (Tarcher, 1st Trade edition, 2001). John Stauber and Sheldon Rampton, Trust Us, We’re Experts: How Industry Manipulates Science and Gambles with Your Future (Tarcher, 2002). Paul A. Stitt, Beating the Food Giants (WI: Natural Press, 1982). Mary Nash Stoddard, Deadly Deception: Story of Aspartame, Shocking expose of the world’s most controversial sweetener (Dallas, TX: Odenwald Press, 1998). James S. Turner, The Chemical Feast: Ralph Nader’s Study Group Report on the Food and Drug Administration (New York, NY: Grossman Publishers, 1970). Jacqueline Van de Kamp, Adverse effects of aspartame: January 1986 through December 1990: 167 citations (Washington, DC: Superintendent of Documents, U.S. G.P.O., 1991). R.J. Wurtman, Dietary Phenylalanine & Brain Function: Proceedings of the First International Meetings (Boston, MA: Birkhauser, 1988). Note: Mary Nash Stoddard is co-founder of the Aspartame Consumer Safety Network and the Pilot’s Hotline. The latter was established as a support network after it was found that pilots have blacked out after consuming aspartame. Because of that, some have lost their pilot’s licenses. SACRAMENTO, Calif. -- Lawsuits were filed in three separate California courts against twelve companies who either produce or use the artificial sweetener aspartame as a sugar substitute in their products. The suits were filed in Shasta, Sonoma and Butte County, California April 5, 2004 by the National Justice League, plaintiffs. The suits allege that the food companies committed fraud and breach of warranty by marketing aspartame-containing products to the public such as Diet Coke, Diet Pepsi, sugar free gum, Flintstone's vitamins, yogurt and children's aspirin with the full knowledge that the artificial sweetener is a neurotoxic drug. Aspartame is a drug masquerading as an additive. It interacts with other drugs, has a synergistic and additive effect with MSG, and is a chemical hyper-sensitization agent. As far back as 1970, Dr. John Olney founded the field of neuroscience called “excitotoxicity” when he conducted studies on aspartic acid, which comprises 40 percent of aspartame, and found it caused lesions in the brains of mice. He made world news on the aspartame/brain tumor connection in l996. Dr. Ralph Walton, Professor and Chairman of the Department of Psychiatry, Northeastern Ohio Universities College of Medicine has written of the behavioral and psychiatric problems triggered by aspartame-caused depletion of serotonin. Aspartame causes headache, memory loss, seizures, vision loss, coma and cancer. It worsens or mimics the symptoms of such diseases and conditions as fibromyalgia, MS, lupus, ADD, diabetes, Alzheimer's, chronic fatigue and depression. Aspartame liberates free methyl alcohol. The resulting chronic methanol poisoning affects the dopamine system of the brain causing addiction. Methanol, or wood alcohol, constitutes one-third of the aspartame molecule and is classified as a severe metabolic poison and narcotic. Recent news is full of reports of world-class athletes and other healthy consumers of aspartame suddenly dropping dead. Sudden death can occur from aspartame use because it damages the cardiac conduction system. The effects of aspartame are documented by the FDA's own data. In 1995 the agency was forced, under the Freedom Of Information Act, to release a list of ninety-two aspartame symptoms reported by thousands of victims. This is only the tip of the iceberg. H. J. Roberts, MD, published the medical text “Aspartame Disease: An Ignored Epidemic” -- 1,000 pages of symptoms and diseases triggered by this neurotoxin including the sordid history of its approval. Since its discovery in 1965, controversy has raged over the health risks associated with the sugar substitute. From laboratory testing of the chemical on rats, researchers have discovered that the drug induces brain tumors. On Sept 30, l980 the Board of Inquiry of the FDA concurred and denied the petition for approval. In l981, the newly appointed FDA Commissioner, Arthur Hull Hayes, ignored the negative ruling and approved aspartame for dry goods. As recorded in the Congressional Record of 1985, then CEO of Searle Laboratories Donald Rumsfeld said that he would call in his markers to get aspartame approved. Rumsfeld was on President Reagan's transition team and a day after taking office appointed Hayes. No FDA Commissioner in the previous sixteen years had allowed Aspartame on the market. In 1983, aspartame was approved for use in carbonated beverages. Today it is found in over 5000 foods, drinks and medicines. Neurosurgeon Russell Blaylock, MD, author of “Excitotoxins: The Taste That Kills” wrote about the relationship between aspartame and macular degeneration, diabetic blindness and glaucoma (all known to result from excitotoxin accumulation in the retina). All of these neurodegenerative diseases are worsened by aspartame. In addition, we now have evidence that excitotoxins play a major role in exacerbation of multiple sclerosis and other demyelinating disorders including trigeminal neuraliga. Blaylock says that new studies show excitotoxins trigger significant elevation of free radicals in the lining (endothelial cells) of arteries, which means that aspartame will increase the incidence of heart attacks and strokes (atherosclerosis). In original studies, aspartame has triggered brain, mammary, uterine, ovarian, testicular, thyroid and pancreatic tumors. Defendants in the lawsuits include Coca-Cola, PepsiCo, Bayer Corp., the Dannon Company, William Wrigley Jr. Company, ConAgra Foods, Wyeth, Inc., The NutraSweet Company, and Altria Corp. (parent company of Kraft Foods and Philip Morris). Plaintiffs have asked for an injunction to stop companies from producing, manufacturing, processing, selling or using aspartame. Plaintiffs in all three cases are seeking a jury trial. The National Justice League is seeking individuals who have been adversely affected by consuming products containing aspartame. To arrange an interview, please Roberta Bellon at 208-246-1171 . When many of my constituents hear that I plan to introduce a bill to ban the artificial sweetener aspartame in the upcoming legislative session, I get a lot of very strange looks. Or worse. Aspartame is currently used in over 6,000 processed foods in this country, practically everything that passes itself off as a "lite" or "nonfat" food or drink. Banning it, I am scolded, will create a massive economic depression, leading to factory closures, layoffs of thousands of workers, bank failures and rioting in the streets. Even the Coca-Cola corporation, which looks at a casual glance like a fairly prosperous company even an incredibly profitable one, I would think will be, I am assured, destroyed by such a ban a very heavy burden to lay on my shoulders. Meanwhile, dozens of corporate lobbyists (the world's second-oldest profession) are praying that I introduce the measure again, as it would occasion a windfall profit of extravagant expenditures for their services when every soda pop manufacturer in the country rushes to hire clever mouthpieces to protect their interests from our attack. It is a veritable full-employment-for-lobbyists initiative. To be candid, the chances of our efforts succeeding in the face of the phalanx of three-piece suits and slick leather briefcases that will be arrayed against our tiny cadre of concerned health advocates is extremely slim. Still, it is absolutely worth doing, I am convinced, if it furthers the awareness-expanding process and builds on the excellent work that is being done by the aspartame whistle-blowers like Santa Feans Stephen Fox and Dr. Kenneth Stoller, and the remarkable Dr. Betty Martini from Atlanta whose tireless advocacy is slowly turning the tide of public opinion against this absolutely worthless and extremely dangerous substance. It is even worth risking the destruction of the Coca- Cola empire, apparently much more fragile than any of us ever imagined. For those wishing to become more familiar with the aspartame menace, a good starting point would be the two hour-long documentary films (available as DVDs) produced by Cori Brackett: Sweet Misery and Sweet Remedy, available through Sound and Fury Productions at www.soundandfury.tv. What you see in these two films is a frightening case study of how corporate greed can completely overwhelm the supposed protections of our governmental watchdogs, the Food and Drug Administration (FDA), the Environmental Protection Agency, and the state and federal departments of Health. It is worth taking a moment here to review the history of how a true poison like this might be passed on to us as "food" over the protests of the scientists who tried to say "No!" but who were, and who continue to be, subverted by corporate money spent to influence politicians. And it may be instructional to consider as well how this same process of erosion in public protections could actually be going on with ever-growing sophistication and success in many other public health areas of concern, such as mad cow disease and E. coli outbreaks at meatpacking plants. Coca-Cola has changed 180 degrees from its position on aspartame in 1980. At that time it testified in opposition to aspartame 's approval at FDA hearings looking into the safety of it. Now they help finance its defense. Of course, the FDA itself has flipped. Its initial denial was reversed a few years later in 1983, when Donald Rumsfeld (ring a bell?) persuaded the Reagan administration that denial was not bad chemistry but bad politics. At that time Rumsfeld headed Searle, the pharmaceutical firm that helped develop aspartame. When concerns over the product's safety seemed likely to produce lawsuits, Searle sold the manufacturing rights to Monsanto, which in turn peddled them to its current primary producer, the Japanese chemical giant Ajinomoto. That outfit has made billions on the production of this artificial sweetener, a significant percentage of which has gone into shoring up the political fortunes of the company’s reputation with American congressional figures. Brilliantly too, the company has consistently made the American Diabetes Foundation one of the chief beneficiaries of its charitable giving largesse that has created vast gratitude and easy acceptance of whatever "scientific" rationales the company chooses to feed the diabetes advocacy community. Many more studies of the medical effects of aspartame consumption have been undertaken with financing from the industry than by independent researchers. Their findings that the formaldehyde-laced artificial sweetener is perfectly safe are, therefore, of questionable objectivity. Last year, however, a truly independent assessment was published by an Italian academic researcher, Dr. Morando Soffritti. His findings substantiate the links between aspartame and cancer, calling it a "neurotoxin" with serious other health consequences and concluding it has major negative impacts on those who ingest it. Soffitti 's study has been repeatedly attacked by industry spokespeople and their paid researchers, but its conclusions stand substantially intact. In Europe and in India, its impact is already producing governmental action to restrict or remove aspartame. Efforts to act similarly in this country have been solely at state levels so far, though the recent congressional changes may open the door to much more active oversight by the Feds than was possible under the previous leadership. Nevertheless, I would like to proceed with our state initiative. It will, win or lose, further the effort to draw attention to the serious medical dangers that aspartame represents. It would serve as a precaution and could save lives. The FDA is ever mindful to refer to aspartame, widely known as NutraSweet, as a "food additive"-never a "drug." A "drug" on the label of a Diet Coke might discourage the consumer. And because aspartame is classified a food additive, adverse reactions are not reported to a federal agency, nor is continued safety monitoring required by law. · NutraSweet is a non-nutritive sweetener. The brand name is misnomer. Try Non-NutraSweet. o Food additives seldom cause brain lesions, headaches, mood alterations, skin polyps, blindness, brain tumors, insomnia and depression, or erode intelligence and short-term memory. Aspartame, according to some of the most capable scientists in the country, does. 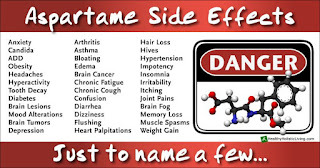 In 1991 the National Institutes of Health, a branch of the Department of Health and Human Services, published a bibliography, *Adverse Effects of Aspartame*, listing not less than 167 reasons to avoid it. · The Pentagon once listed it in an inventory of prospective biochemical warfare weapons submitted to Congress. o But instead of poisoning enemy populations, the "food additive" is currently marketed as a sweetening agent in some 1200 food products.